Junior Hanwul Choi gets fired up after the Tigers take the third set. The Tigers fell short in their first league game against the San Marino Titans after five challenging, hard-fought sets at home on Thursday night. South Pas lost the first set 25-16, came back to win the second and third sets 25-20 and 25-16, but gave up the fourth and fifth sets 26-24 and 15-3, ultimately losing the game. During the first set, the Tigers had a bit of trouble keeping up to the Titans’ level of play. The Tigers could not control the Titans’ hard hits due to a lack of communication on the court. There were many hitting and blocking errors, but senior Jason Barrientos won most of the points for the Tigers. The Tigers lost the first set 25-16. After a disappointing first set, the Tigers came back to outplay San Marino in the second and third sets. In the second set, the Tigers were composed and ready to play. 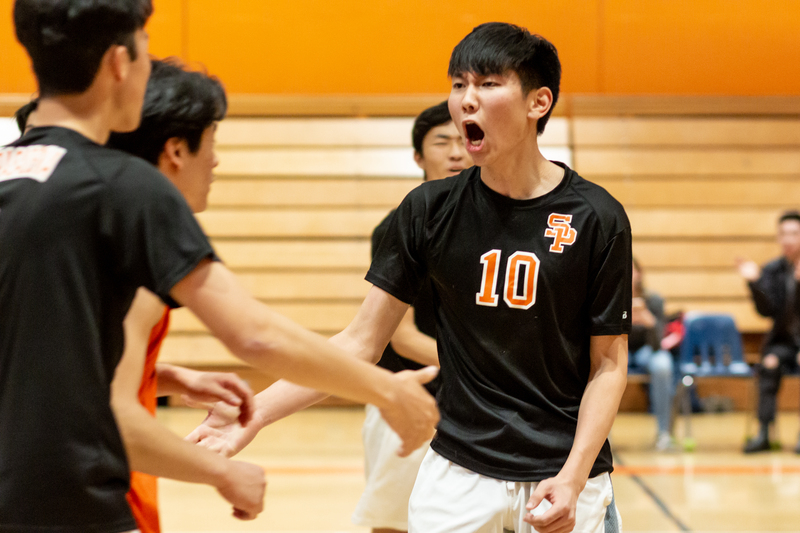 Seniors Paul Pan and Scott Ishikawa claimed a majority of the points for the Tigers, as well as assisted junior Dylan Schreibfeder in blocking. Setter Tyler Lieu perfectly set up the hitters for powerful hits which the Titans couldn’t handle. The Tigers won the second set 25-20. Senior Paul Pan was a menace on the blocks, denying multiple Titan spikes. In the third set, the Tigers exuded a confidence that allowed them to dominate the entire match. With a series of blocks by Schreibfeder, Pan, and Ishikawa, the Tigers maintained a significant lead against the Titans. Not only did Schreibfeder block, but he made numerous kills and tips that helped keep the Tigers ahead of the Titans. Lieu also tipped the ball many times which was an important strategy in gaining points for the Tigers. The Tigers defeated the Titans in the third set 25-16. The fourth set was a long battle between the Tigers and Titans. 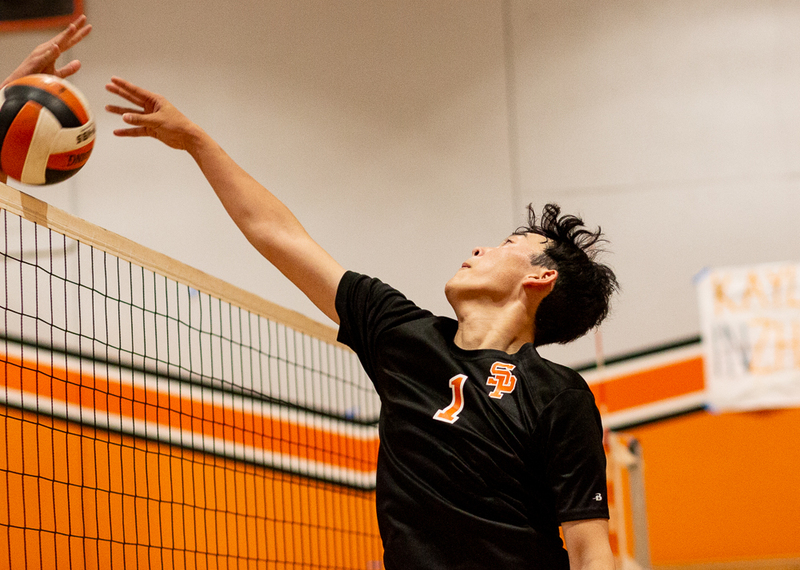 Senior Addison Hsiao, junior Hanwul Choi, and sophomore Colin Sheng made incredible digs that kept the Tigers in the game. They also made great passes to setter Lieu, who continued to make adequate sets to hitters Pan and Barrientos. The teams were so evenly matched that there were multiple back and forth rallies. The score was extremely close throughout the entire set, but the Tigers could not maintain a significant lead. After Hsiao helped the Tigers to tie the game at 24 with his serves, the Titans capitalized on the Tigers’ weak spots and scored. The Tigers lost the fourth set 26-24. By the fifth set, the Tigers were no match for Titans, who were obviously hungrier for the win. Nearly every point the Tigers lost was due to the Titans blocking their hits. After an extremely short set, the Tigers lost 15-3, giving away the game. The Tigers play Temple City away at 3:30 p.m. on Tuesday, March 19.